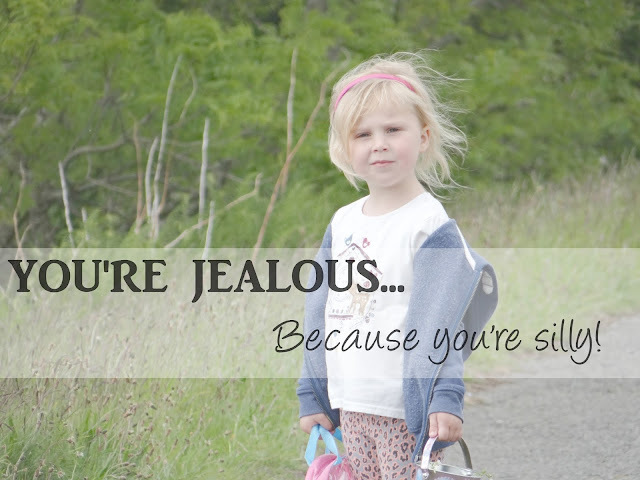 You're Jealous Because You're Silly. "Why am I jealous Mia?" This is just one of the funny things that come out of my eldest daughters mouth. This conversation happened when she was getting told off for misbehaving actually. Everyone says that Mia is hilarious with the things she says, and I have to agree with them. Even though she was getting told off, I had to have a quiet giggle to myself after she said I was jealous. I have no idea where she got the fact that I was 'jealous' though? Oh how I would love to know what goes through their little minds all day. I was getting dressed one morning. "Oh I like your boobies mam"
I guess that's a compliment, even if it is from your 5 year old daughter. ha ha! I went to the bathroom, came back and there she was trying on one of my bras. I burst out laughing. She says this often. The only problem is, the smell is usually a person. Even if it's a nice smell she will ask what it is in the most disgusted voice ever! It's quite embarrassing! She has even called a woman 'fat' before. She did get told off about that because it is very rude but I found it a little funny because of how blunt and straight forward she can be. Too blunt sometimes. I'm going to try my best to write down her funny saying from now on and hopefully have a full post about it to share it all with you and something I can look back at in a few years time! Hopefully one day she will read it too! They do come out with the most amazing comments sometimes don't they, I often wonderful what's going through their minds!